Periodontal diseases are caused by bacterial infections that attack gums, ligaments and bone. Although the body has some natural defenses that resist bacterial attacks, these may not fully protect gum and bone tissues from inflammation and infection. There are several kinds of periodontal disease. Often painless, these diseases may develop slowly or progress quite rapidly, and they can occur at any age. Unless you have regular dental checkups, including a periodontal exam, you may not be aware you have a problem until your gums and bone have been seriously compromised. The mouth contains a large number and variety of bacteria that form a sticky film called plaque. In this film, the bacteria that cause periodontal diseases create toxins (poison), which irritate the gums and bone. Even if you brush and clean between your teeth every day, you may not completely remove plaque, especially around the gum line. Plaque that is not removed can harden into a rough, porous deposit called calculus, or tartar. This can create conditions that lead to chronic inflammation and infection. Tartar can only be removed when your teeth are cleaned in the dental office. It's possible to have periodontal disease and not have warning signs. That's why regular dental checkups and periodontal examinations are important. Healthy gingiva (gum tissue) and bone anchor teeth firmly in place. Gingivitis develops as toxins in plaque irritate the gums, making them red, tender, swollen, and likely to bleed easily. Periodontitis occurs when toxins destroy the tissues that anchor teeth in the bone. As gums detach from teeth, pockets form and fill with plaque. Tooth roots are exposed and become susceptible to decay and sensitivity to cold. Advanced periodontitis is present when the teeth continue to lose their attachment and the supporting bone is destroyed. Unless treated, the affected teeth frequently become loose and may fall out or require removal by a dentist. The goal of treatment is to reduce inflammation, remove "pockets" in the gums, and treat any underlying causes of gum disease. It is important to have the teeth cleaned thoroughly. This may involve use of various tools to loosen and remove plaque and tartar from the teeth. Proper flossing and brushing is always needed, even after professional tooth cleaning, to reduce your risk of gum disease. 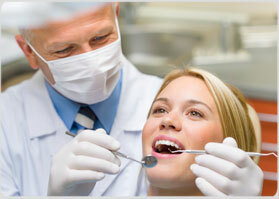 Dr. Grant or his hygienist will show you how to brush and floss properly. Patients with periodontitis should have professional tooth cleaning more than twice a year. Surgery may be necessary. Deep pockets in the gums may need to be opened and cleaned. Loose teeth may need to be supported. Dr. Grant will evaluate your periodontal health and make recommendations towards achieving a healthy smile.